Martin Galvin writes a history of the Gerry McGeough case in the context of the current political sitution in the North (for the Pensive Quill). One former IRA commander was presented for a “royal handshake” while one suspected former Volunteer was presented with a more customary brand of royal invitation for carrying out IRA commands. Gerry McGeough found himself on a dubious honours list. His royal invitation, engraved by three Queen’s Bench appeals judges, “invited” the Tyrone Republican to remain a guest of their “gracious queen” at HMP Maghaberry. It was an offer he could not refuse. The Stormont Agreement says that credit towards 2 year early release must be accorded those “sentenced outside Northern Ireland” on pre-1998 conflict related offenses. The crown nullified these terms and summarily dispensed with the 7 1/2 years McGeough had spent on IRA charges in German and American prisons. Those who choreographed the “do-able” handshake did not permit inconvenient topics like Republican prisoners or crown murder victims, to intrude on their discussions. Such matters were relegated for mention after the jubilee tour, when neither Cameron nor his queen need take note. The week began with a queen’s handshake symbolizing change and ended with a queen’s bench meting out the same old injustice. Few legal battles embodied so many issues and inspired so much emotional reaction as that of Gerry McGeough. Dail deputies and Stormont MLAs have journeyed to Maghaberry and urged his release. Americans have given help to his family that once would have been provided by Green Cross, An Cumann Cabhrach and Tyrone PDF. Meanwhile DUP members, who scarcely conceal contempt for Republicans with whom they sit in partnership at Stormont, attended his trial to spew venom at someone they see as an unrepentant Republican. Nigel Dodds called it “outrageous” that anyone was “demanding the release of such a person from prison.” Arlene Foster decried any “special treatment” while demanding McGeough serve his 20 year sentence “in full”, apparently without normal remission, much less the two year early release accorded to other prisoners. Maurice Morrow whinges about public monies paid for McGeough’s legal defense, while collecting public monies as Councillor, Lord and MLA triple-jobber. In order to understand the issues and emotions running through this case, it is important to begin with the crucial political debate that foreshadowed McGeough’s imprisonment. The March 2007 election climaxed a watershed period. Sinn Fein had stamped party approval on the re-named Royal Ulster Constabulary, and urged supporters to ratify this move at the polls. The vote would launch a new era of justice. Patten, they claimed, had opened the constabulary ranks to nationalists. Future chief constables and someday even justice ministers would take up their posts subject to a Sinn Fein veto. Constabulary boards and district partnerships were touted as controls which Republicans would work to “put manners on the RUC.” A widely quoted Andersonstown News editorial predicted it would be “fun” bringing the RUC to heel. Calls to “trust the leadership” swayed many doubters. Other equally sincere veteran Republicans, Brendan Hughes and John Kelly among them, felt a moral duty to say no. The RUC was the cutting edge of British repression. RUC hands were bloodstained by shoot-to-kill, or murders carried out in collusion with loyalists. Hundreds had been locked in British prisons, on confessions taken under torture and whitewashed with perjury in Diplock courts. The re-badged RUC-PSNI would merely dress up British law and rule in new insignias and uniforms. The constabulary would be commanded, trained and deployed by RUC veterans. These skeptical Republicans feared that familiar nationalist faces on constabulary boards would become cosmetic fronts allowing the British to camouflage repression behind the mask of powerless public talking shops. Gerry McGeough was among those veteran Republicans who stood against any nationalist endorsement for the British constabulary. Without party machinery or funding, he took the debate against the RUC to the same Fermanagh-South Tyrone venues where he had once campaigned for Bobby Sands MP. McGeough said this battle for Republican hearts and minds was really about future elections, when dreamers of fun putting manners on the RUC had awakened to the dawn of continuing British repression. With his votes cast but not yet counted, McGeough walked out to retrieve an item from his car. He never returned. The renamed constabulary had pocketed its mandate and was about to take a historic first step in its version of a new era of justice. The candidate was surrounded in a premeditated arrest by waiting RUC-PSNI officers. Gerry McGeough, over fifty, married and settled with four young children, was charged with joining the Provisional IRA in 1975, and, taking part in a 1981 IRA ambush of an armed member of the UDR, in which both were seriously wounded. The new era had begun with the new constabulary making an old fashioned retaliatory arrest of an Independent Republican whose real offense seemed to be campaigning for election against them. McGeough’s solicitors filed for dismissal based on decades of delay. The Tyrone Republican could have been arrested 20 years earlier, simply by lodging an extradition warrant during his 4 year confinement in a notorious German bunker prison, or during his 3 years in an American jail on IRA weapons charges. McGeough lived openly in Tyrone, joined in BBC studio debates, attended public rallies, and gave speeches outside constabulary barracks with his campaign posters prominently displayed. Instead the crown moved against him only in March 2007, outside the polling centre where his votes were being tallied. A British judge had refused to charge RUC members for Nora McCabe’s murder on July 9, 1981, and for perjury during the cover-up which followed, even after television film belied their cover story of rioting and petrol bombers. Too late, the judge said. Charges delayed so many years would be a clear abuse of process and inevitably dismissed. Somehow this same judge applied different rules to Gerry McGeough, for an incident which occurred four weeks before Nora McCabe was murdered by the RUC. Human rights observers from British-Irish Rights Watch and the Committee for the Administration of Justice were ordered out of the courtroom. British pledges that McGeough was free to return to Tyrone were disavowed. McGeough was blamed that no extradition warrant was lodged or that no attempt was made to bring charges when he returned home. RUC-PSNI members were blameless for the ongoing cover-up of Nora McCabe’s murder. If the heralded new era meant anything how could the same judges still bend the same rules in favor of the RUC-PSNI and across the backs of nationalists? Soon after Gerry McGeough’s arrest, the British began to admit a litany of state force murders and murder cover-ups of innocent nationalists. Cameron euphemistically called the Bloody Sunday murders, “unjustified and unjustifiable killings”. These are polite words for murder or manslaughter. Cover stories given under oath by these troopers before Widgery or Saville must accordingly be perjury. No arrests of any of these troopers have yet been made, including named troopers identified in multiple killings. Many fear that the newly announced 4 year constabulary investigation will deliver more years of delay and disappointment for these courageous families. Will this inquiry end in judicial terminations like Nora McCabe’s murder, or sham trials like those which whitewashed the murders of John Downes and Majella O’Hare? Will the constabulary be more interested in pursuing IRA membership charges than British Army murder charges? The families of some other victims received apologies but no arrests. In more politically sensitive cases, such as the Ballymurphy Massacre, Pat Finucane’s assassination, or the Dublin-Monaghan Bombings, the crown refused or stonewalled any inquiry. No one predicts arrests of any members of the British Army or RUC who colluded in murders by their loyalist agents or tortured nationalists at interrogation centers and then sent them to Long Kesh or Armagh, with perjured accounts of voluntary confessions. The crown seems to have bestowed an undeclared amnesty on members of the British Army and RUC which does not apply to those Republicans like Gerry McGeough who speak against the British administration. Britain’s monarch recently visited Belfast and shook hands with Martin McGuinness, Deputy First Minister in the local devolved regional assembly. Throughout Northern Ireland the level of unemployment is as high as it was prior to the royal visit, security walls to keep neighbours apart are as permanent as they were before Elizabeth arrived and Northern Ireland’s local media has returned to reporting the usual tensions generated by the Orange Order in the run-up to the annual battle of the Boyne celebration on 12 July. In other words and in spite of the media ballyhoo, it is business as usual in this most westerly region of Mrs Windsor’s kingdom. Of course it was a remarkable and notable media moment when Britain’s head of state (and commander in chief of the country’s armed forces) met with a former chief of staff of the Irish Republican Army. Undoubtedly, it was gripping drama to have the queen meet a reformed rebel. At the same time, there has been many similar memorable moments on British television and most receive their due recognition at the annual British Soap Awards. The handshake was of no greater significance than any other pointless gesture and contributed nothing to improving the quality of life for the masses. Therein lies the real difficulty many of us have with this contrived handshake. It was merely a piece of theatre, which does nothing to address the real problems faced by the people of Northern Ireland. If anything, this type of symbolic posturing is actually harmful. It displaces and/or prevents mature and necessary debate and reflection on the unequal nature of our society and the detrimental impact of Britain’s ruling class upon the public’s well being. Martin McGuinness was presented with what was possibly a once in a lifetime opportunity to explain a republican position and philosophy, not just to the unionist people of Northern Ireland but also to the wider British population. As Deputy First Minister at the time of a jubilee visit, he would have had airtime on each network and coverage from every press outlet in Britain and Ireland. By refusing to meet the queen, Martin could have raised questions about the very nature of the British monarchy and in doing so, opened to scrutiny many of the systemic faults afflicting contemporary society. Why, he might have asked, is the monarchy still guilty of one of the most blatant acts of discrimination in the United Kingdom? The royal family adheres to the Act of Succession, which excludes from the throne every person who is not a practising member of the Church of England? This may not seem important to some but, nevertheless, it sends a dangerous signal to nasty elements in Britain that ancient and destructive privileges are justified as a birthright. Moreover, in the context of Northern Ireland, community relations are hardly improved by ignoring the fact that only a member of the reformed church is worthy of being head of state. Martin McGuinness might also have raised the matter of Britain’s armed forces. Why did a man who witnessed the events of Bloody Sunday in his hometown, not seek to criticise an institution (i.e. the monarchy) that is uncritically supportive of Britain’s military? Britain’s soldiers and sailors have not only played a cruel part in Ireland’s history but Martin would have done well to point out that the current actions of British troops in Iraq and Afghanistan are hardly beyond criticism either. Most crucial of all perhaps was why Martin did not raise the issue of the profoundly anti-democratic practice of a having a hereditary head of state? Nothing reinforces the dire inequality produced by the British class system so much as the endorsement granted by monarchism to the transfer of power, prestige and wealth within the elite section of society. Gross inequality, which is at its worst in Britain since 1940 according to an article by Professor Danny Dorling in the Guardian is not only offensive to our sense of justice but is an economic blunder. Encouraging the over concentration of wealth in fewer hands not only deprives an economy of the spending power necessary to promote growth but also leads directly to the type of ‘casino’ capitalism that has caused the current financial crisis and the subsequent impoverishment of millions. Had Sinn Fein and Martin McGuinness decided to adopt and articulate the republican position outlined above, unionists in Northern Ireland may well have criticised their decision. It would, however, have been a significant step towards inviting that community to deal meaningfully with Irish republicanism as a coherent philosophy rather than as a hostile ethnic identity. It would not have provided a panacea but then, allowing people to think that deference to monarchy is progress is hardly a remedy either. Moreover, it would have given Irish republicans a rare opportunity to make a positive and progressive contribution to a necessary debate about wealth and privilege in our neighbouring island across the Irish Sea. A Diplock trial was ordered. Those who design repressive British laws choose their terms with deliberate irony. Words like ‘temporary’, ‘emergency’ or ‘prevention of terrorism’ invariably create provisions and powers which are permanent, lasting and routinely used to terrorize nationalists. These non-jury courts replaced Internment, with show trials that could be counted upon to dispose of unwanted Republicans. Diplock courts were “abolished” which meant never to be used except in every case where the crown deems them useful. Only a Diplock court would entertain, much less credit, the testimony against McGeough. There was no identification by any witness. McGeough was forcibly stripped and photographed after his arrest. Photos of an old wound were displayed as the crown speculated that it might possibly be a bullet wound, and possibly sustained as far back as 1981. A bullet fragment with no forensics or DNA link to McGeough was introduced. The smashed fragment may or may not have been the same caliber fired by then UDR member Sammy Brush. A key Garda witness, known as the “The Badger”, was named by former MI6 officer Fred Holroyd as someone linked to British intelligence. Pages from a fictional novel authored by Gerry McGeough were read into the record as evidence of intent. Finally a political asylum application, whose confidentiality is a cornerstone of international law, was admitted without hesitation. During the trial McGeough suffered two heart attacks. The judge ordered constables to monitor McGeough’s treatment at the hospital where he was confined, and to retrieve his medical records. In 1916, British commanders ordered Army doctors to keep James Connolly alive until British troopers could shoot him. Nearly a century later, it seemed a British judge feared Gerry McGeough might die from a heart attack before the crown could jail him. The verdict was a foregone conclusion. The flimsy evidence somehow was pronounced inescapable proof of guilt. The crown judge refused to wait for medical documents and directed that McGeough be taken forthwith to Maghaberry. Senior DUP members celebrated outside the courtroom. McGeough was jailed for an IRA ambush that took place on June 13, 1981. Republican prisoners, in June 1981, were in the midst of a Hunger Strike, forced upon them by years of beatings and brutality, much of it accompanying mirror searches or strip-searches. Today in Maghaberry the same sort of brutal strip-searches are being inflicted, despite the agreement of August 2010, to halt the practice. On his sentence date McGeough was subjected to such a search. He ended up in a hospital instead of court. His solicitors noted that brutality of this type could be life threatening. David Ford’s appointment, with Sinn Fein backing, brought no protection to Republican prisoners from the same sort of callous brutality that Brendan Hughes and Bobby Sands resisted. The judge imposed a twenty year sentence, angry that Gerry McGeough made no apologies for the IRA. The Diplock judge’s verdict and sentence did not end McGeough’s legal fight. The Stormont Agreement mandates early release for those imprisoned 2 years on pre-1998 offenses. The carefully crafted document specifically referenced those “sentenced outside Northern Ireland” for qualifying offenses and noted that the rights of individual prisoners must be protected under international law. The provision might have been drawn up with McGeough’s case in mind. In August 1988 McGeough had been arrested on the Dutch-German border and charged with actions arising from the IRA campaign. He remained in a notorious German bunker prison until 1992.He was then transported under an extradition warrant to America on charges that he had supplied weapons for the IRA in 1982. Gerry McGeough was imprisoned approximately 7 1/2 years outside northern Ireland, on charges that would have been qualifying IRA offenses in the six counties. He was entitled to early release but was denied by the crown. McGeough filed for a judicial review to challenge the British. His solicitors cited more than a dozen comparable cases where prominent Republicans had been accorded early release credit for jail time spent in other jurisdictions through a British legal device, termed a Royal Prerogative for Mercy (RPM). Ironically the matter was assigned to Seamus Treacy. While an idealistic young barrister a quarter century earlier, Treacy had traveled to Germany as a human rights observer and adviser at the request of McGeough’s co-defendant Gerry Hanratty. Treacy expressed genuine anger at the conditions and injustices which Hanratty and McGeough suffered. Now donning the wig and robes of a British judge, Treacy atoned for his youthful idealism by wiping out those years from the crown ledgers. The “change agenda” had struck again. McGeough appealed again. Within days after the royal handshake, McGeough got the brand of royal invitation conferred on many Republicans. His appeal was denied and he was kept at HMP Maghaberry. The crown court redefined the words “outside northern Ireland” to mean only Britain and Ireland, without explanation why more expansive terms had deliberately been written into the agreement. Subtle technical distinctions between McGeough’s case and the dozen comparable cases introduced by his solicitors were contrived. For good measure, Britain’s Weston Park pledge that those wanted on pre-1988 offenses would not be pursued, was hastily discarded as nothing more than an unfulfilled wish, with no legal effect. Ironically one of the first Republican prisoners to commiserate with McGeough was Martin Corey, who within days would find himself the recipient of his own “royal invitation”. It is said that Gerry McGeough will only serve 2 years with little more than 6 months to go. To paraphrase the old saying made famous by IRA author Ernie O’Malley, it is easy to sleep on another man’s 2 years. However the early release provided by the Stormont deal is by no means guaranteed. Ford and his parole commissioners inspire little confidence. If released McGeough would remain on British license well into his 70s. Martin Corey and Marian Price are even now examples of internment by license. 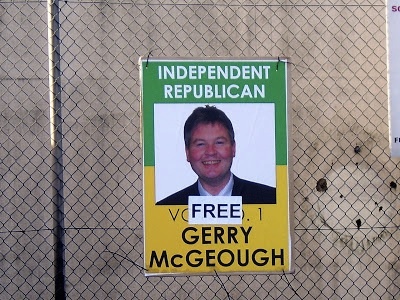 No one would be surprised if still more injustice awaits Gerry McGeough. This case began more than 5 years ago with a soul-searching debate amongst Republicans. Many believed that endorsing the re-named RUC-PSNI and joining British constabulary boards would enable Sinn Fein to housetrain the British constabulary away from injustice. Other Republicans feared that the British would tout Sinn Fein’s backing and constabulary board seats, to make the party accomplices in British injustice. For Gerry McGeough, Marian Price, Martin Corey, and so many other victims of British oppression imposed in the queen’s name, the photograph of the royal handshake has forever sealed and settled that debate.